Le blog de la Bergerie Sharing the faith . . . in English . . . et en français! During Advent, I decided to read the story of Jesus again. I wanted to rediscover the story of the Incarnation one more time, so I decided to read every night a few chapters of the Gospel of Luke and the Acts of the Apostles. (Yes, I am that kind of a person -- I assign myself reading projects.) I decided to read it as I would read an adventure story, without checking footnotes, without researching words, without doing any cross-referencing. I wanted to let the story flow of its own and to immerse myself in it. So I started reading every night. And the most interesting thing happened. As I was progressing daily on my reading assignment, I could not help but notice that "the story" was surfacing again and again at other moments in my day: It was getting fleshed out, and it was coming from a variety of sources. First, I noticed it during prayers, and then during the liturgy. Sudden insights were bringing the story to a new level: my reading was enlarging it, was revealing more and more of the bigger picture, teaching me about the transcendence of God. And it delighted me. What surprised me most is that I started picking up additional bits and pieces of "the story" in the most unusual places, even on Facebook. At night, I was reading about this amazing Good News. And, during the day, I kept noticing the "goodness of my neighbor." The links between the original story and the one unfolding itself today were becoming highlighted like golden threads. Jesus brought us a whole new worldview, coupled with the ultimate interior journey -- the Christ-like inner path -- and it is summarized in the two commandments of love of God and love of neighbor. And this is exactly what I was able to see on Facebook. Once in a while (and you can never know when it will happen) one post will generate the most interesting discussion. It starts with a quirky statement or a profound one and then suddenly there is a flurry of comments. It can be about abortion or the death penalty or the criteria for a just war, or it can follow simple questions: "Why do we dream?" or "Is God reading our status updates?" (By the way, my answer was, "Yes, since he knows every hair on my head.") There is a lot of honest seeking and searching, and much kindness and caring, underneath the quick exchanges. I love my friends' jokes and the gentleness that can shine from one end of the world to the other just because someone said they were struggling that day. Those are precious, blessed moments. And I was able to pick up on them because my "grace and goodness antennas" were sharpened by my nightly readings. I finally finished reading the Acts of the Apostle after Christmas. The following night, as I was standing in my parents' kitchen fixing an apple pie and listening to Nick Cave's haunting song, "I Let Love In," it all seemed to come together like pieces of a puzzle: the preparing of food for others, the will to focus on love and caring, the golden links between people and the blessed moments. I thought it was very appropriate that the conclusion would happen over food. I love cooking, and my epiphany moment even got me to change the recipe halfway through it: Since my mother cannot really eat the crust of pies anymore, I decided to switch to a Clafoutis and I created my very own apple Clafoutis (a baked French dessert) right there on the spot. It turned out to be a hit. Does it really matter to be able to see the golden threads? Absolutely. It is the only way to face the constant avalanche of natural disasters, global conflicts and local crimes. Isn't it interesting how a simple reading of the Incarnation fueled a deeper and larger reading of life? I already know what I will do for Lent: I am going to reread the Gospel of John and the Letter to the Romans. 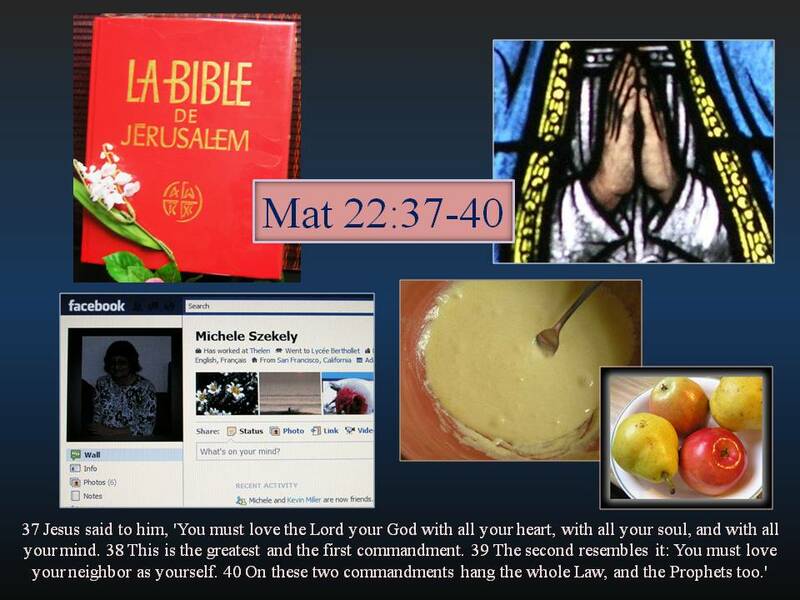 Catholic San Francisco published the above commentary " Of Scriptures and prayers, Facebook and food " on February 4, 2011. Click here and go to page 14 et Voila! It has also been published on the Catholic.org site on February 12; click here .